Part of the fun of bikepacking is trying to figure out the ideal gear kit for a trip. Each trip gives you a chance to try out new gear or a new way of organizing gear on the bike. Being the numbers geek that I am, I decided to build a gear list spreadsheet that would help with distributing weight evenly on the bike. When packing for a bikepacking trip, my goal is to get as much weight as possible in the frame bag and keep the backpack lighter. Your goal may be even distribution of weight or the elimination of a backpack. 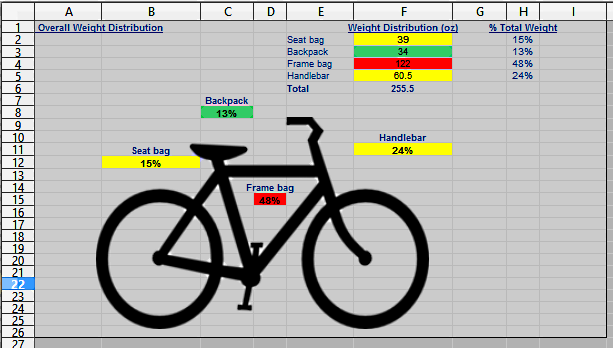 The spreadsheet assists in these tasks by showing how the weight is distributed across the handlebar bag, frame bag, seat bag, and backpack. It also shows the total weight of each gear category (sleep system, clothing, food, electronics, cook kit, etc). Of course, a spreadsheet will never, ever substitute for real life trial and error testing of your gear setups, but it can give you a gauge of how evenly your gear is distributed. The category totals can help you find areas of your kit where you could focus on weight reduction. As you add or remove items from the gear list spreadsheet, the top section with the bike picture automatically updates the weights, percentages, and color indicators. The color indicators function like a stop light with the heaviest area of your gear setup red, the lightest area green, and the remaining two areas yellow. Don’t edit any of the grey shaded areas. These values auto calculate based on the data entered in the lower section of the spreadsheet. Go to the “Setup” tab and enter your preferred categories. I have created categories that work for me, but feel free to edit them. A maximum of 15 categories can be created, but hopefully you don’t breakdown your gear into that many categories. Go back to the “GearList” tab and start entering your bikepacking gear. Watch the calculated weight distributions and make any necessary changes. This spreadsheet gives you an idea of the weight distribution of a particular bikepacking setup, but it doesn’t allow you to list all of your gear. On each bikepacking trip, the gear changes due to weather, new gear, or trip distance. The ideal solution would be a single spreadsheet that allows you to enter all of your gear on one tab and then use another tab that lets you choose a gear setup for a trip. This would allow you to create several gear setups and compare them against each other. That’s my idea for the spreadsheet, but please let me know if you have another suggestions or problems using the spreadsheet. Just don’t get too caught up in spreadsheet fun and forget to go ride your bike. Thanks very much for creating the spreadsheet. Steven, glad you like the spreadsheet so far and you have some very good suggestions. For the bags, are you thinking of some way to track the weight and also the volume so you would know how much can fit inside the bags? Adding more bags up front or other places should not be too hard. It would require some dynamic spreadsheet “magic” but I think I could manage that. From my experience camping, the only way to know if something is going to fit in a bag is to try fitting it into a bag. So I wouldn’t (personally) we worried about volume. However, having a field (right near each bag) that would also take into account the weight of each bag unpacked would be useful as these add up, especially if you’re using several at a time. I definitely think that having more bags (by the areas I mentioned above) would be crucial for those who like to either use a lot of bags or use different/various bag setups. Steven, makes perfect sense. You are right that the bag weights do factor into the total weight. With the current version of the spreadsheet, you could list the bags as just another item to get their weight included. I’ll also work on an updated version that lets you enter the bag info in a specific cell(s). Great! I think another situation where including the weight of the actual bags themselves would be handy is for calculating when flying/checking baggage. Previous post: Do Your Best Thoughts Occur When Riding?